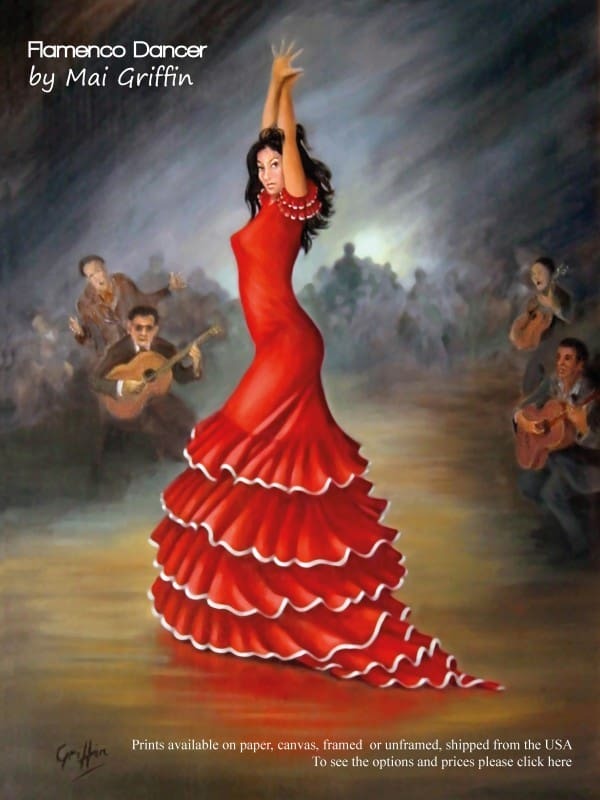 A young Spanish woman dances Flamenco to music from a group of guitarists, in informal surroundings, for the enjoyment of a small crowd. After several years at Art College (now part of the University of Wales), Mai began painting professionally in 1950. She has enjoyed painting in many countries, from the UK and the Continent to S.E.Asia and the Middle East. Her works include official portraits of Royalty, Heads of State, prominent figures and several significant historical works for the National Museum of Brunei Darussalam. Mai also writes supernatural mystery novels – starring the artist Clarrie Hunter! Her fifth novel in the series will soon be published. I accepted commissions while still at Art Academy from 1949 – among my first was a Christmas frieze for a shop window. Soon after this, I received my first portrait commission and my studio work began in earnest. I have enjoyed living and working in many different places all over the world. Although I never advertised, I was lucky enough to be so much in demand that for most of my career, constant commissions meant that I painted almost every day for 8 – 10 hours at a time! Most of my work hangs in private galleries and is not on general display. Now retired, I still accept work, particularly for portraits and enjoy painting as much as I ever did. I am very pleased to make some of my paintings available as prints to a wider public. The Flamenco Dancer is always popular, so I am very pleased that is has found a home on www.thisisspain.info – where it surely belongs – flamboyant, vibrant and passionate – she is Spain!